Today, AUNewsBlog.Net sharing great news for you. 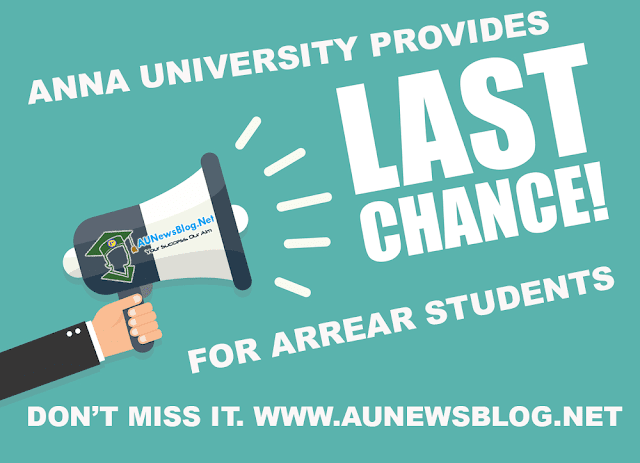 Now, Anna University planned to provides two more additional chances for students who joined before 2010. This is great news for you all. Because lots of students request Anna University for giving chance to clear arrear exams. Yes Friends, Now you can able to write exams on February 2018 and August 2018. Don't miss this great opportunity. This is a great chance for you. Don't miss it. All the best and clear your papers soon. Note: Official Notification and Exam Fee details will announce soon on AUNewsBlog.Net. Please, regularly check our blog. We will update soon. Hi, is there any further update on this?